Being a man in the twenty-first century isn't easy. In fact, trying to live up to a masculine ideal that may be nothing more than myth has left many men frustrated and angry. Often unable to express their emotions, these men appear buttoned-up until a seemingly minor setback unleashes a torrent of rage that can destroy personal and professional relationships. Suppressed anger, when it finally boils over, scalds everyone involved-including loved ones, co-workers, and even strangers. Christian counselors David Stoop and Stephen Arterburn offer solutions in this trade paper version of The Angry Man. They show what happens when men's deep-rooted anger starts to ruin relationships, jobs, and health, and they help sufferers find their way back from the brink. Men will find the help they need to reimagine a positive image of their masculinity; their loved ones will find advice on reaching a man at his boiling point. Steve Arterburn is a bestselling author, radio host, and entrepreneur. He is the founder and chairman of New Life Ministries, the largest faith-based broadcast counseling and treatment ministry. He is also the host of “New Life Live!”―a nationally syndicated daily radio program―and founder of Women of Faith conferences. He is the author of many bestselling books, such as the Every Man’s Battle series and The God of Second Chances. Arterburn lives in Indianapolis with his family. Arterburn, Stephen, Stoop, David A.
Arterburn, Stephen; Stoop, David A. 5. 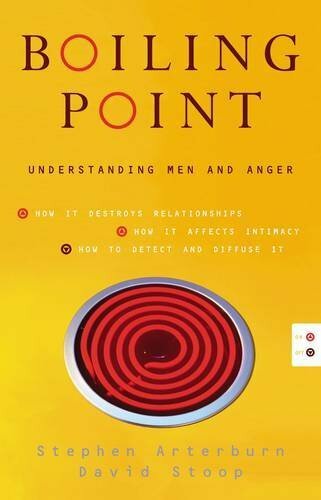 Boiling Point: Understanding Men and Anger Arterburn, Stephen and Stoop, David A.